Omega’s Caliber 9300 chronograph movement can be described as an Co-Axial escapement chronograph with Si14 Silicium balance spring, two barrels, column wheel and vertical clutch. Sounds interesting, right? But what does all this mean exactly? Sadly, all too often articles and posts fail to explain the various mechanism found in this impressive movement. We assume you’re starting to get the point – indeed, we will give it a shot. Without going to much into detail regarding the technical details behind each, we will try to explain the benefits and discuss the alternatives. The Co-Axial escapement was an original idea of the late master watchmaker George Daniels, which was adopted by Omega around 1992 and finally commercialized in 1999 in the caliber 2500. Since then, it has found its way to most of Omega’s new calibers, most notably the caliber 8500 and 9300. Compared to the traditional escapement -invented in the 18th century- , the Co-Axial technology greatly reduces friction in the escapement. Less friction means less wear on parts and less lubrication needed – thus giving the movement greater accuracy over time and lengthening intervals between servicing. The balance spring is the beating heart of a mechanical watch movement. Traditionally, the balance spring is made of metal and as such, it is vulnerable to magnetic fields. Silicon on the other hand is not affected by magnetism. It is also considered more shock-resistant when compared to a regular balance spring. Besides a beating heart, a watch movement also needs a place to accumulate the energy. This is where the barrel & mainspring come in. While many manufactures opt to go for multiple barrels as to enlarge the power reserve, this is not the case with Omega – although the caliber 9300 has an over-average power reserve of 60h. So what is the point if not the lengthen the power reserve? To increase the stability of the rate over an extended period of time. In an automatic movement, the barrel is traditionally fitted with a slip clutch as to prevent over winding. 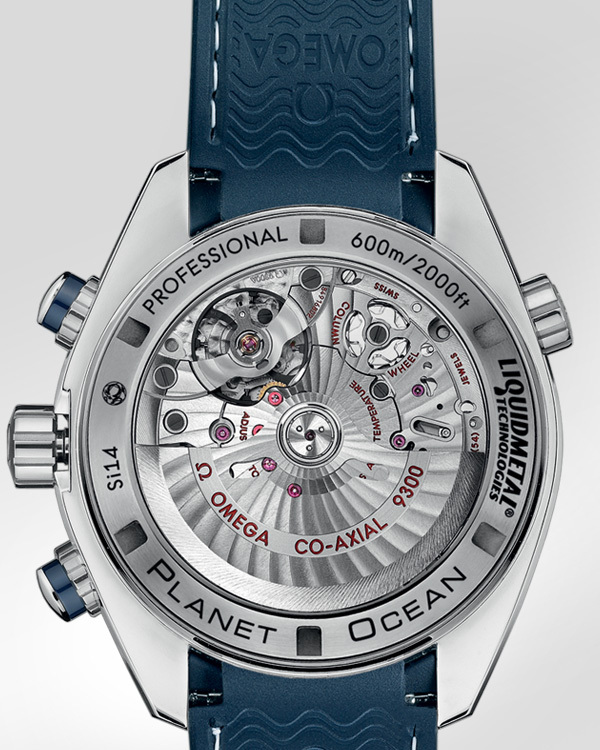 In Omega’s Two Barrel system, the first barrel is constructed in the style of a manual wind movement – sans slip clutch. The second can be considered a traditional barrel for automatic movement – with slip clutch. When the first one is ‘filled’ to the max, the second one takes over. When winding down -in other words, when the watch is running-, it first uses the energy stored in the second barrel. When that energy is equal to that of the first barrel, both will start releasing their energy simultaneously. As such, the released energy will be at a constant level for an extended period of time, thus minimizing the loss of accuracy due to decreased torque. As everyone who has ever used a basic stopwatch knows, there are three fundamental chronographic functions: start, stop and reset. Inside the movement, these functions are controlled by either a column wheel or a so-called cam-switching. Traditionally, a mechanical chronograph is fitted with a column wheel. Mostly due to the endless need to reduce costs and increase production, the cam-switching-system is the dominant style of today’s chronographs. To be frank, each mechanism has its own merits. The cam-switch (as found in the caliber 861, 1861 and their siblings) has a very long life span and is very robust. It is also easier to assemble, which results in lower costs. In general it also reduces the height of the movement when compared to a column wheel movement. The column wheel on the other hand is the traditional solution. The triggering of the various functions is generally considered to be smoother and more precise, which is it’s main advantage. Also, the column wheel is interesting from not only a mechanical but also an aesthetic point of view. A chronograph movement in its simplest form is based on a regular -time-only- movement. Only when the chronograph is engaged, the otherwise dormant timing functions are started by setting their gears in motion. The coupling of these functions can be achieved by moving a gear in either horizontal or vertical direction. The timing function is now coupled to the timekeeping function and will thus start to run. The vertical coupling system has a few advantages: the start of the timing function is very smooth and sans ‘jump’ which often occurs movements fitted with a horizontal coupling. It is said to be more proof to wear, when using the chronograph on a regular basis. The decline in amplitude when the chronograph is engaged, as found in calibers with horizontal coupling, is much less, if not non-existent. However, the horizontal coupling is the traditional solution. As the change of gears happens in horizontal direction, it is much easier to observe – which can be a joy to behold. We will continue to improve this article and are working on version 2.0, which will go into depth on the subjects touched in this article.